AutoFrisian Dew is the autoflowering version of our outdoor best seller Frisian Dew – Buy Now! 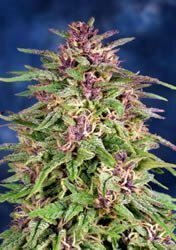 AutoFrisian Dew is the very first AutoFem variety developed outdoors in Holland and especially developed for outdoor growing in Northern climates. AutoFrisian Dew has taken two years to develop and the selection process and breeding also take place in Holland. AutoFrisian Dew was created from a strong and robust green phenotype of Frisian Dew. This results in good quality strong cannabis, ready to harvest around 10-11 weeks after the seed germinates. The use of the green Frisian Dew parent means that purple offspring account for only 10% of the AutoFrisian Dew, 90% of them are green.AutoFrisian Dew is approximately 1m tall though it can grow up to 1.3m in good conditions. She has a strong main cola and has a sweet taste with earthy flavours. Best yields are achieved in warm, sunny outdoor location or greenhouse. Yields of 50g+ per plant are standard, 100g+ in optimum conditions. AutoFrisian Dew is a strong, hardy and mould-resistant variety which will be appreciated by outdoor growers. It should be planted outdoors from April onwards in southern Europe. In North Europe it does best when planted out after the last frost in May/mid-May.